Abortion advocates often use a coat hanger to symbolize the "age of back-alley abortions" where women were forced to seek abortions from "unqualified butchers." The number of women who died from illegal "back-alley" abortions was often said to be in the thousands. However, according to the U.S. Bureau of Vital Statistics, there were only 39 women who died from illegal abortions in 1972. If you have had an abortion or know someone who needs healing from the hurtful consequences of an abortion, these sites may be of help. Please feel free to browse them. If you know someone else who could use post abortion help please refer them to these links and let them know that people involved at these sites truly care. This site is for women who have had an abortion. It is a source of information on the after effects of abortion and post-abortion healing. There are over 500 hundred links to thousands of printed pages of original research, testimonies, articles, and resources. For over 16 years, women and men have been coming to Project Rachel, the post-abortion ministry of the Catholic Church, for help in healing their emotional and spiritual wounds. 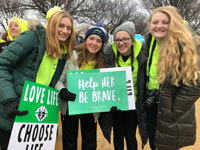 The Silent No More Awareness Campaign is an effort by women who have suffered abortions to make the public aware of the devastation abortion brings to women, men, and their families. A safe place for those who have had abortions to find comfort, hope, understanding, and healing in the painful aftermath of abortion. This is a place to start healing after an abortion. We offer you the compassion of Christ, the companionship of fellow Catholics, and a path to understanding and healing. healing from a past abortion under the guidance of an online lay counselor. A safe place to renew, rebuild and redeem hearts broken by abortion.